Pt47-129, photographed at the Wrocław Główny depot in August 1961. Photo from my collection. 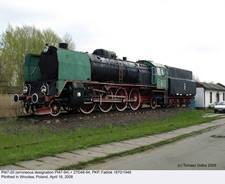 Pt47-152 + 33D48-7 (HCP 1402/1950), photographed in Chabówka, June 18, 2001. This Pt47-171 + 33D48-8 (Fablok 2111/1950) is erroneously designated Pt47-100. Photo taken in Kościerzyna in August 2000. 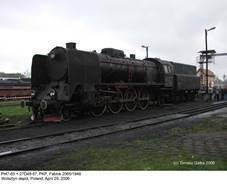 These who visit this page often probably know this photo: Pt47-112 + 34D74-42 (HCP 1310/ 1949), Wolsztyn, April 29, 2002. 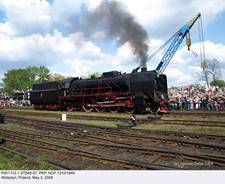 The same machine photographed during the ‘Steam Locomotives Parade’ in April 2005 – note different tender. 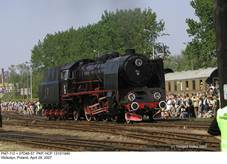 This engine participated in the steam locomotives parade in Chabówka on July 29, 2006 – some photos are here. ...but this time with 27D48-57 tender, which is much more typical (previously coupled with Pt47-65). Pt47-112 appeared also at the 2008 Show; photo taken on May 3. Another machine from Wolsztyn: Pt47-106 + 27D47-22 (HCP 1304/1949) on static display, photographed on September 8, 2004. 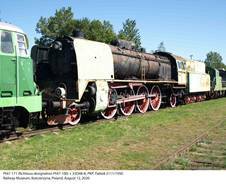 …but things sometimes improve: in October 2006 this engine was transferred to Pyskowice and now is a part of the TOZKiOS collection. Photo taken on May 2, 2009. Pt47-93 + 33D48-21 (Fablok 2093/1950), Zduńska Wola Karsznice depot, photographed on October 27, 2003. 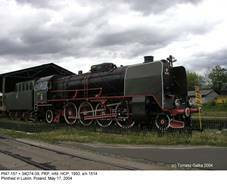 Pt47-157 + 34D74-39 (HCP 1514/1950) plinthed in Lublin, May 17, 2004. Another picture of this locomotive, taken on July 29, 2017. 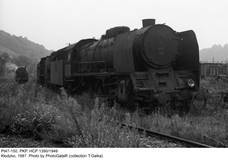 … and wreck of Pt47-44 + 32D74-?, (Fablok 1894/1949), photographed on the same occasion. 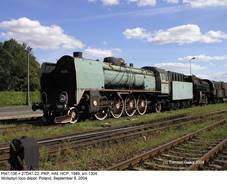 …and the same engine photographed there on October 28, 2005. Pt47-20 + 27D48-94 (erroneous designation Pt47-94, Fablok 1870/1948), plinthed in Wrocław, April 18, 2008. Pt47 with 27D48 tender; side drawing from PNP. 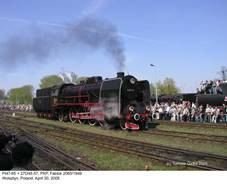 Pt47-65 + 27D48-57 (Fablok 2065/1949), photographed during the ‘Steam Locomotives Parade’ at Wolsztyn depot, April 30, 2005. More photos of the Pt47-65 can be found here. In late 2005, Pt47-65 was withdrawn from service. 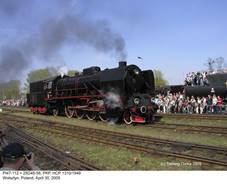 This picture was taken in Wolsztyn on April 29, 2006. Fortunately, this withdrawal was only temporary. This picture was taken during the ‘Parowozjada 2009’ in Chabówka on September 5, 2009. This Pt47-28 + 27D48-? 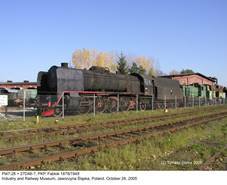 (Fablok 1878/1949) was transferred to the Industry and Railway Museum in Jaworzyna Śląska in 2005 from Gniezno depot (where she was probably intended for cannibalization); photo taken on October 28, 2005. 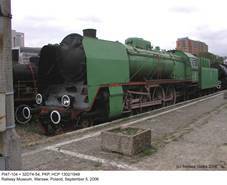 Pt47-104 + 32D74-54 (HCP 1302/1949), Railway Museum, Warsaw, September 5, 2006. ...and Pt47-36. Photos from my collection. Pt47-150 (HCP 1390/1949), probably withdrawn, photographed in Kłodzko in 1987. Photo by PhotoGataR (from my collection). 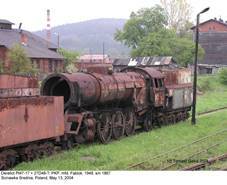 Pt47-13 (Fablok 1863/1948), withdrawn in 1988, was initially plinthed in Bielsko-Biała. 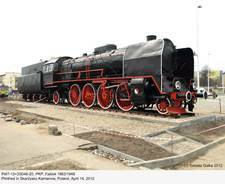 Transferred to the Kraków Płaszów depot in 2001, it was moved to Skarżysko Kamienna in 2011 and plinthed near the railway station on April 13, 2012, with the 33D48-20 tender. This photo was taken on the next day – motion gear and plates are still missing. Pt47-13 was officially ‘unveiled’ on April 19. Pt47-13 again, after the whole place has been tidied up and some missing elements fitted: July 8, 2012. …and Pt47-33, photographed near Lubów on September 28, 1979. 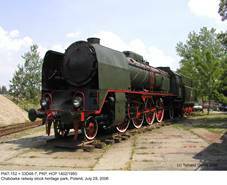 Pt47-101 (HCP 1282/1949) is currently kept at the Kraków Płaszów depot. Photo taken on June 20, 2013. 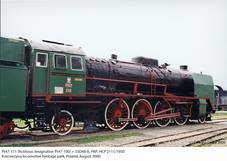 Pt31 express engine, of which 110 were built between 1932 and 1940, is considered by many the best pre-war Polish locomotive. 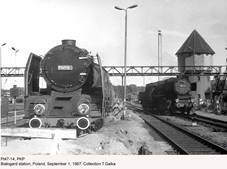 After WWII, Polish railways regained only 66 examples, most of them between 1947 and 1948. Lack of express locomotives was particularly acute. Initially it was intended to introduce new normalized types, but their development would have been lengthy and complex. In order to speed up deliveries, as early as in 1947 it was decided to re-commence production of modified Pt31 at both HCP and Fablok. New variant was designated Pt47 and differed from its predecessor in several details. Boiler was fitted with steel firebox and circulation tubes; later rocking grate was introduced. Distance between tube walls was shortened by 100 mm and evaporating surface was marginally reduced, but with two more smoke tubes superheater surface was increased by almost 10%. Boiler fittings were modified. Frame was thoroughly redesigned and empty locomotive, without tender, was lighter by two tonnes. Externally, Pt47 differed from Pt31 mainly in having steam and sand domes covered by a single fairing, different smoke lifters and fully enclosed driver’s cab. A semi-streamlined version, heavier by about four tonnes, was also proposed by Fablok shortly after production had commenced, but was not accepted and did not progress beyond preliminary design stage. Pt47s were coupled with a variety of tenders. Initially, 34D48 tenders were used which, in fact, were slightly modified 34D44s of German origin (DRG 2’2’T34), with enlarged coal boxes. Later, probably from Pt47-91 onwards, indigenous 33D48s became standard, but their journal axle bearings were prone to overheating. Some of them, fitted with coal feeders, were re-designated 26D48, later rebuilt and re-designated 27D48. Modified tenders with roller axle bearings, much more suitable for high speed, became 34D74 (without coal feeders) and 27D74 (with coal feeders). Finally, rebuilt 32D29 tenders from Pt31 were re-designated 32D74. Tests with 32D47 tub tenders (the same as used with Ty45 freighters) were not successful, due to uneasy running above 80 km/h. Prototype was built by Fablok in 1948 (s/n 1851). Initial orders included 100 examples from Fablok and 35 from HCP. In 1950 additional orders were placed with both manufacturers, for 20 and 25 examples, respectively. Production was terminated in 1951. These locomotives were built exclusively for PKP and soon earned a reputation comparable to that of Pt31s – of good, powerful and reliable machines. Most new Pt47s were directed to principal lines throughout the country and were often used with heavy drafts. 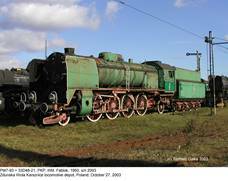 As electrification progressed, they were from mid-1970s – together with other steam locomotives – relegated to secondary duties, but in 1980 PKP rosters still included 156 examples and four years later 144. In late 1980s, however, their number rapidly dwindled and last of them, Pt47-13, was withdrawn from active service in October 1988. One example (Pt47-134, HCP 1336/1949) was transferred to a food industry plant in 1985, subsequently serving as a stationary boiler for several years. 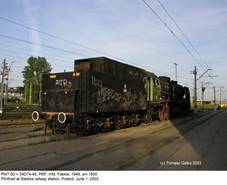 Two more, Pt47-11 and Pt47-48, survived in this unconspicious role at the Lublin depot until 1996. According to lists compiled by Tomisław Czarnecki (available at www.holdys.pl/tomi), 21 Pt47s still existed in Poland early 2005, although one-third of them merely as wrecks. 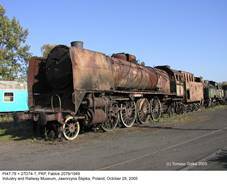 Two derelict engines (Pt47-2, Fablok 1852/1948, and Pt47-105, HCP 1303/1949) were scrapped in September 2005. 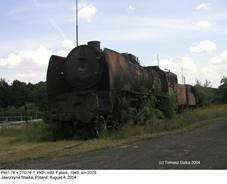 Two more, dumped in Ścinawka Średnia (Pt47-17, Fablok 1867/1948, and Pt47-44, Fablok 1894/1949) followed soon. Two machines, based in Wolsztyn, were kept operational for quite a long time. 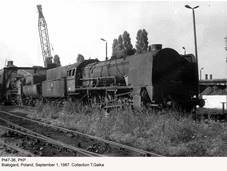 Pt47-65 (Fablok 2065/1949) is a well-known locomotive which often ran with scheduled trains. 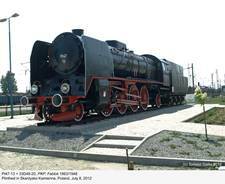 In August 2012 it was transferred to Chabówka for a major repair, or more appropriately a reconstruction. Many elements and sub-assemblies had to be made from scratch and the engine was outshopped only in April 2016. Pt47-112 (HCP 1310/1949) was restored in service in 1989. 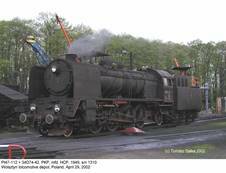 In early 2005 it was fitted the 25D49-98 tender, as used with Ol49s – albeit bearing 34D74-42 designation! 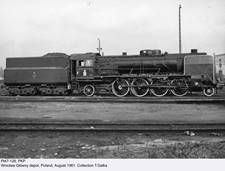 The aim was to match the 20 m turntable at Wolsztyn depot (axle base of the ‘new’ tender is shorter by 850 mm), but railway purists used to grind their teeth. It has to be mentioned that immediately before major repair Pt47-65 was also coupled with a 25D49. In 2007 Pt47-112 was fitted with ‘standard’ tender, previously coupled with Pt47-65, erroneously numbered 27D47-58. 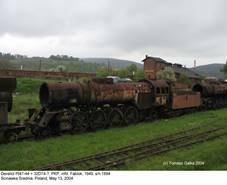 Unfortunately in 2008 this engine was ultimately withdrawn from use and is now kept in Wolsztyn on static display. Initially it was intended to maintain Pt47-28 (Fablok 1878/1949) in working order, but finally this machine was used as the source of spares for two operational examples. 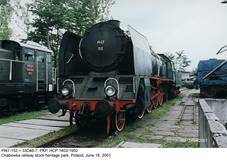 Each of principal Polish railway museums or heritage parks has a Pt47: Warsaw Railway Museum (Pt47-104, HCP 1302/1949), Industry and Railway Museum in Jaworzyna Śląska (Pt47-78, Fablok 2078/1949, albeit in a poor condition), Zduńska Wola Karsznice locomotive depot (Pt47-93, Fablok 2093/1950), Chabówka heritage park (Pt47-152, HCP 1402/1950) and Kościerzyna locomotive depot (Pt47-171, erroneously designated Pt47-100, Fablok 2111/1950). Several engines (including prototype Pt47-1) are plinthed at various locations. One more locomotive of this type was kept operational for some time. 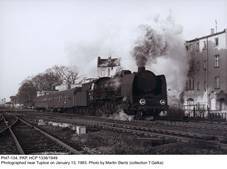 Pt47-138 (HCP 1340/1949), after withdrawal, was sold to Austrian Brenner & Brenner tourist railway (named after proprietors, not Brennerpass!). 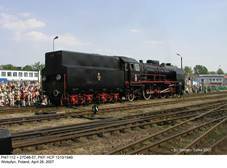 This machine was externally made similar to Pt31 (boiler domes fairing was removed and smoke lifters were modified), to commemorate service of the latter type as class 919 with Austrian railways during WWII and shortly afterwards. 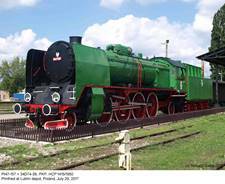 After undergoing a major overhaul in Česke Velenice (Czech Republic) in 2000, this engine joined the B&B fleet as 919.138, becoming the company’s most powerful locomotive. Its last reported service was in September 2006. 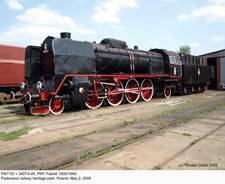 Pt47 crowned the development of express steam locomotives in Poland. Built to fulfill virtually the same demands as Pt31, it was designed not for extreme speed, but rather high tractive effort with moderate axle load. For that purpose, four coupled axles were used; axle load was only by 0.5 tonne higher than in much lighter Pacific Pm36, but tractive effort was higher by over 27%. 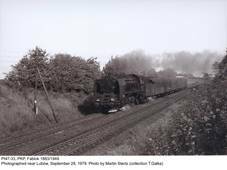 Contrary to many European railways (including Germany and UK), express Pacifics were not favored by PKP: three coupled axles did not allow to keep axle load within acceptable limits, while single-axle lead truck was sufficient for speeds up to 100 km/h. 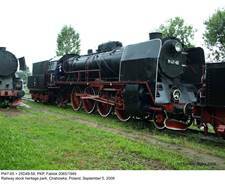 Mikados were much better suited for specific Polish conditions, where few lines were suitable for high speed traffic and, at the same time, good acceleration with heavy drafts was demanded. In such service, Pt47s performed very well.